Full access to two (2) licenses of Livestream Studio is available with a Vimeo Premium membership or a paid Livestream account. Download Livestream Studio on your Windows or Mac computer. Follow the on-screen steps to install the software, after which it will automatically launch. 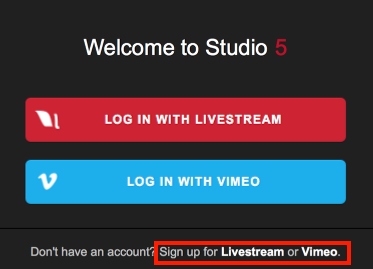 Studio will prompt you to log into either a Livestream or Vimeo account. If you do not have an account, you can sign up for either by clicking the desired provider at the bottom of the prompt. Once your account is created and paid for, you may then log into Studio using your account credentials. Studio will indicate that your full access has been unlocked. Because Studio needs to authenticate your login, you will need an internet connection to access the software. If you lose your internet connection, you can continue to use Studio offline for up to 24 hours before being required to reconnect. While Livestream Studio has the ability to stream to various providers, a paid Livestream account does not allow you to stream to Vimeo, and a Vimeo Premium account does not include the ability to stream to Livestream. If you purchased a Livestream Enterprise account, you will have a phone support PIN for the length of your membership. Phone support is not available with Vimeo Premium.